provide reconciliations of such forward-looking adjusted measures to GAAP net earnings due to the inherent difficulty in forecasting and quantifying certain amounts that are necessary for such reconciliation, including adjustments that could be made for changes in contingent liabilities, net losses of Viking Therapeutics, stock-based compensation expense, mark-to-market adjustments for amounts owed to licensors, effects of any discrete income tax items and fair value adjustments to Viking Therapeutics convertible note receivable. Management has excluded the effects of these items in its adjusted measures to assist investors in analyzing and assessing Ligand’s past and future core operating performance. Additionally, adjusted diluted earnings per share is a key component of the financial metrics utilized by the Company’s board of directors to measure, in part, management’s performance and determine significant elements of management’s compensation. Forward-Looking Statements This news release contains forward-looking statements by Ligand that involve risks and uncertainties and reflect Ligand's judgment as of the date of this release. 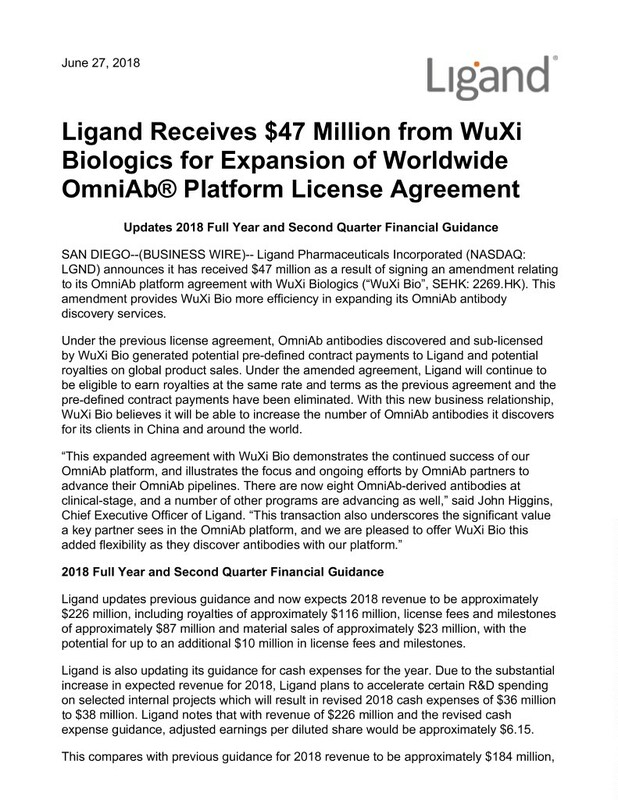 These include statements regarding Ligand's amended license agreement with WuXi Bio under which Ligand expects to receive a $47 million upfront payment and may receive future royalties; WuXi Bio’s expectations that it will be able increase the number of antibodies it discovers and outlicenses; the number of OmniAb-derived antibodies in development; Ligand’s future revenue, and guidance regarding the second quarter and full-year 2018 financial results. 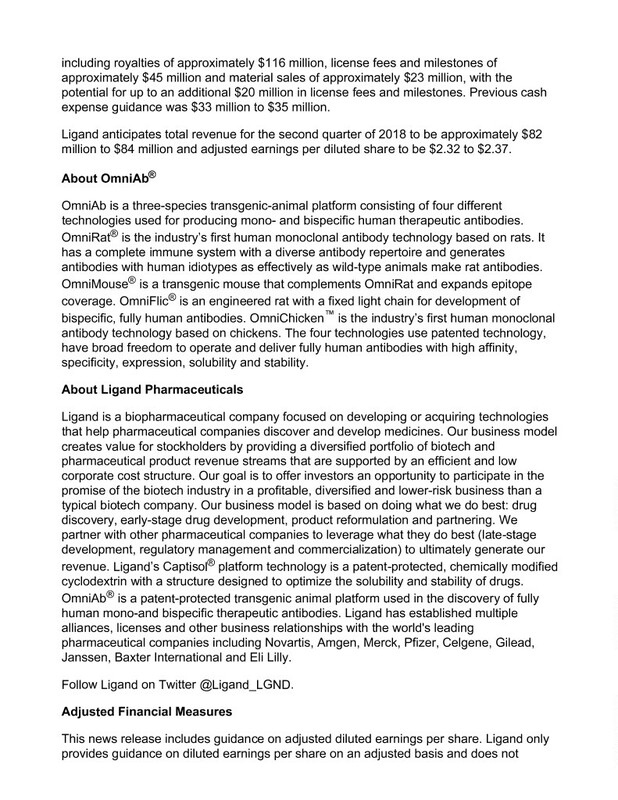 Actual events or results may differ from Ligand’s expectations due to risks and uncertainties inherent in Ligand’s business, including, without limitation: there can be no assurances that WuXi Bio will successfully develop or outlicense antibodies using the OmniAb platform or that companies who license such antibodies will successfully develop or market such antibodies; Ligand may not receive expected revenue from royalties, Captisol material sales and license fees and milestone revenue; Ligand and its partners may not be able to timely or successfully advance any product(s) in its internal or partnered pipeline; Ligand may not achieve its guidance for 2018 or any portion thereof or beyond, including the second quarter; Ligand's second quarter and full year 2018 revenues may not be at the levels as currently anticipated; Ligand may not generate expected revenues under its existing license agreements and may experience significant costs as the result of potential delays under its supply agreements; Ligand and its partners may experience delays in the commencement, enrollment, completion or analysis of clinical testing for its product candidates, or significant issues regarding the adequacy of its clinical trial designs or the execution of its clinical trials, which could result in increased costs and delays, or limit Ligand's or it partners’ ability to obtain regulatory approval; and unexpected adverse side effects or inadequate therapeutic efficacy of Ligand's or its partners’ product(s) could delay or prevent regulatory approval or commercialization. The failure to meet expectations with respect to any of the foregoing matters may reduce Ligand's stock price. 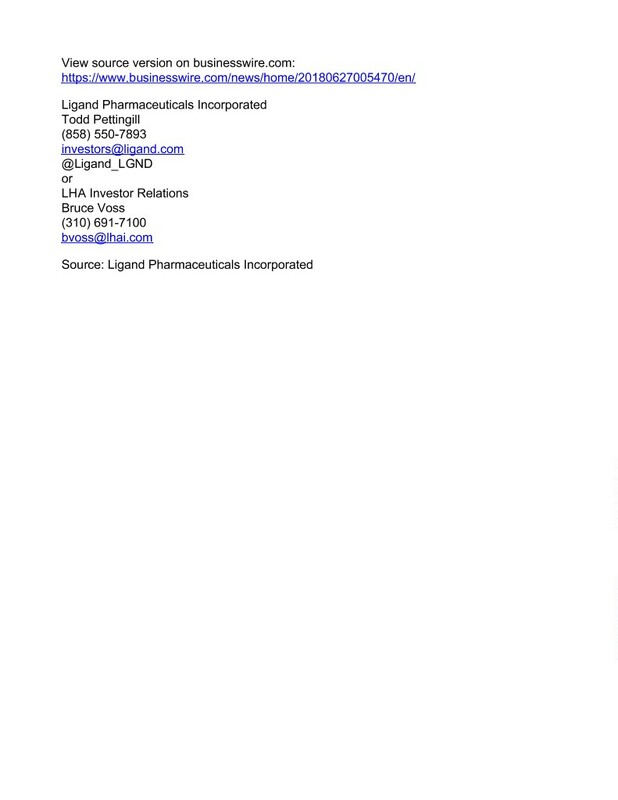 Additional information concerning these and other important risk factors affecting Ligand can be found in Ligand's prior press releases available at www.ligand.com as well as in Ligand's public periodic filings with the Securities and Exchange Commission, available at www.sec.gov. 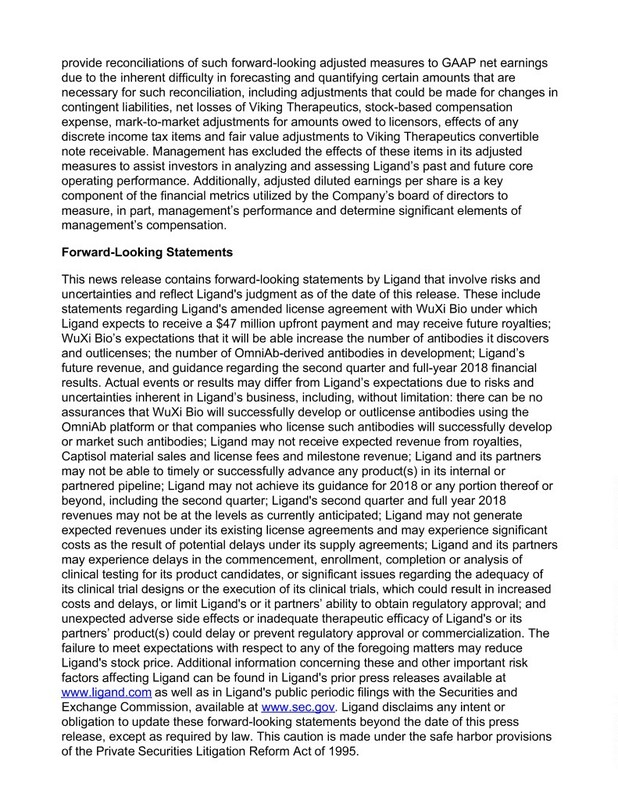 Ligand disclaims any intent or obligation to update these forward-looking statements beyond the date of this press release, except as required by law. This caution is made under the safe harbor provisions of the Private Securities Litigation Reform Act of 1995.